Last weekend development branch of Inkscape, a rather popular free vector graphics editor, got a whole new tool for measuring things. This can be considered next stage of work on support for SVG Fonts, started earlier as a Google Summer of Code project. The new tool allows measuring length of every object it passes (the actual cut, not the bounding box). It can be activated from Tools toolbar or by pressing M shortcut. The new tool is not complete yet, and has a number of issues that are already known and will be addressed shortly. There's also a number of feature requests in the tracker. Felipe is, however, very responsive, so it's quite likely that by the time 0.49 is out, the tool will be polished and shiny (it's already kicking, don't you agree?). Given how popular Inkscape is for type design (contrary to FontForge regarding type production), all these new features are very, very welcome. If you wish to try these new features, you can build trunk yourself, or you can use nightly builds, including newly added PPA for Ubuntu. This work by Felipe is also related to Argentina tour of Dave Crossland who co-created Open Font Library and designed Cantarell typeface used in GNOME 3 by default. 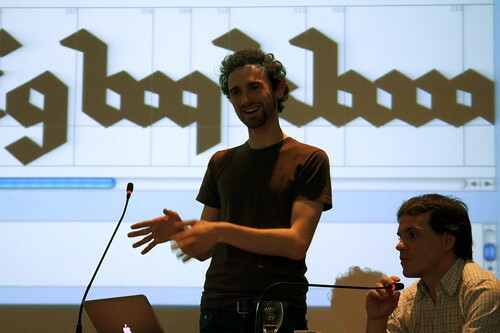 Dave has been doing type design and typography workshops in Argentina for both local and Brazilian designers for several weeks now.